Hakusan, Japan, June 30, 2016 – EIZO Corporation (TSE: 6737) today announced the new ColorEdge CG247X, a 24.1-inch color management monitor with 1920 x 1200 native resolution that meets the needs of the media and entertainment industry. 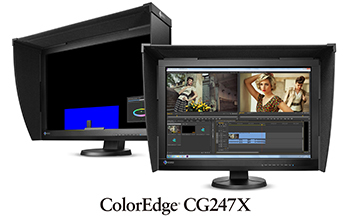 The ColorEdge CG247X is the successor to the CG247 and includes a wide array of features specifically for post production editing and video creation. The ColorEdge CG247X is equipped with all of the advanced features of EIZO’s CG Series lineup of professional color management monitors with many improvements over its predecessor. The monitor’s wide color gamut faithfully reproduces 98% of the DCI-P3 standard used in digital cinema, an increase from 95% with the previous model. Preset modes for EBU, Rec. 709, SMPTE-C, and DCI also ensure editors can work in the appropriate color spaces and gamma values. Switching between modes is easily done via the buttons on the front of the monitor. In addition, the buttons are LED-backlit for easily seeing in dimly-lit studio environments. The monitor’s contrast ratio was also increased from 1000:1 to 1500:11, producing true blacks that are otherwise difficult to display on typical LCD monitors. The ColorEdge CG247X is also equipped with a retardation film which allows dark tones to retain their depth even when viewed from an angle. A typical monitor takes 30 minutes or more for its brightness, chromaticity, and tone characteristics to stabilize. The ColorEdge CG247X takes a mere 3 minutes. The monitor comes with a light-shielding hood that effectively prevents glare on the monitor’s screen caused by ambient lighting. The hood is newly designed and attaches to the monitor magnetically. This allows users to attach the hood quickly and easily without needing to connect separate parts. The ColorEdge CG247X is equipped with a built-in calibration sensor that swings onto the screen when calibrating, eliminating the need for a third-party calibration device. Using the bundled ColorNavigator 6 software, studios can schedule the monitor to self-calibrate at a specific time, ensuring that consistent settings are always maintained. The ColorEdge CG247X also supports ColorNavigator NX quality control (QC) software that offers asset management of client ColorEdge monitors and covers calibration, emulation, built-in sensor correlation, and color mode settings. Further QC management is available with ColorNavigator Network which allows administrators to maintain centralized quality control whether the monitors are local or remote, all hosted on a secure cloud server. 1 Typical value when DUE Priority is set to “Brightness”. 2 A graphics board and software which support 10-bit output are also necessary for 10-bit display.